Saudi Arabia cut ties with Iran on Sunday, responding to the storming of its embassy in Tehran in an escalating row between the rival Middle East powers over Riyadh's execution of a Shi'ite Muslim cleric. By Sam Wilkin and Angus McDowall for Reuters. DUBAI/RIYADH, Jan 3 (Reuters) Saudi Foreign Minister Adel al-Jubeir told a news conference in Riyadh that the envoy of Shi’ite Iran had been asked to quit Saudi Arabia within 48 hours. The kingdom, he said, would not allow the Islamic republic to undermine its security. Jubeir said the attack in Tehran was in line with what he said were earlier Iranian assaults on foreign embassies there and with Iranian policies of destabilising the region by creating “terrorist cells” in Saudi Arabia. Speaking on Iranian state television, Deputy Foreign Minister Hossein Amir-Abdollahian said in Tehran’s first response that by cutting diplomatic ties, Riyadh could not cover up “its major mistake of executing Sheikh Nimr”. 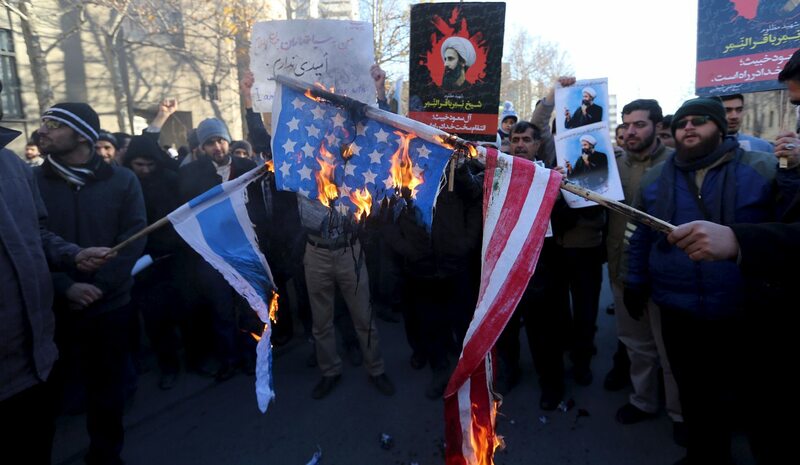 However, Saturday’s execution of a cleric whose death Iran had warned would “cost Saudi Arabia dearly”, and the storming of the kingdom’s Tehran embassy, raised the pitch of the rivalry. Strong rhetoric from Tehran was matched by Iran’s Shi’ite allies across the region, with Sayyed Hassan Nasrallah, the head of Lebanese militia Hezbollah, describing the execution as “a message of blood”. Moqtada al-Sadr, an Iraqi Shi’ite cleric, called for angry protests. Iran’s President Hassan Rouhani condemned the execution as “inhuman”, but also urged the prosecution of “extremist individuals” for attacking the embassy and the Saudi consulate in the northeastern city of Mashhad, state media reported. Khamenei’s website carried a picture of a Saudi executioner next to notorious Islamic State executioner ‘Jihadi John’, with the caption “Any differences?”. The Revolutionary Guards said “harsh revenge” would topple “this pro-terrorist, anti-Islamic regime”. Iraq’s top Shi’ite cleric Grand Ayatollah Ali al-Sistani described the executions as an “unjust aggression”. The opinion of Sistani, based in the Shi’ite holy city of Najaf south of Baghdad, carries weight with millions of Shi’ites in Iraq and across the region, including in Saudi Arabia. The U.S. State Department said Nimr’s execution “risks exacerbating sectarian tensions at a time when they urgently need to be reduced”, a sentiment echoed by EU foreign policy chief Federica Mogherini. The State Department also urged Saudi Arabia to respect and protect human rights. In Istanbul, hundreds of protesters, some carrying pictures of Nimr and chanting “Saudi Arabia will pay the price”, gathered outside its consulate on Sunday as riot police stood guard.